Photo source: Collection of C. Stewart Rhine (taken during Winter 1939-40.). The name Loch Raven was coined about 1875 by Willaim Gilmor for the first water-supply dam for Baltimore City that was built near Raven Rocks. The rocks were named for a 1724 local land owner, Luke Raven. Loch, of course, is Scottish for "lake". 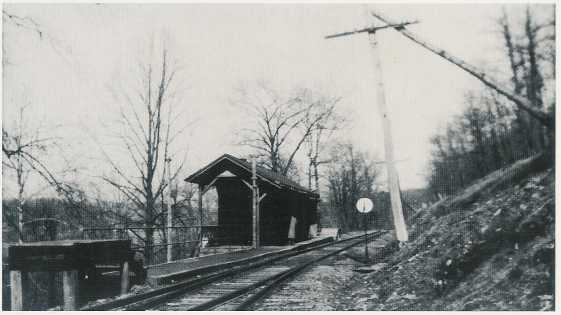 This shot was taken facing north, showing the south and east sides of the Loch Raven station. The 3' wide narrow gauge rails of the Baltimore & Delta Railway reached this area on July 29, 1882, and a station stop called Loch Raven was soon established here. On August 28, 1882, the Baltimore & Delta Railway lost its identity and was merged into the Maryland Central Railroad. Fischer, Rudy, Scenes From Ma & Pa Country - Then and Now: Jenifer's Trestle & Loch Raven Station Areas - Baltimore County, Maryland; TIMETABLE, Vol 18, Number 4, Fall 2002; The Maryland and Pennsylvania Railroad Historical Society, Inc.
© Copyright The Maryland and Pennsylvania Railroad Historical Society, 2003.